Order in 20 Hours 43 minutes 51 seconds for dispatch tomorrow! 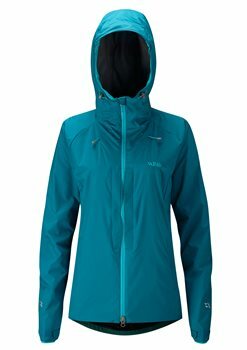 New for Spring/Summer ’16, the Vapour-rise™ One Jacket is a light-weight, highly breathable and innovative softshell jacket, designed using our unique Vapour-rise™ technology to offer the ultimate women’s climbing and mulit-sport jacket. Developed exclusively by Rab® and Pertex®, Vapour-rise™ creates breathable, high wicking and quick drying performance clothing. The Vapour-rise™ One Jacket features a fully helmet-compatible hood and anti-snag Velcro adjustable cuffs to increase an already packed feature set. These features lend this jacket to climbing and multi-sport use in the summer months, whilst the high wicking nature of the Vapour-rise™ fabrics also enable the Alpine Jacket to be worn during the winter months as a next-to-skin layer.